2 recipes in 1! This is perfect for a lazy cold Sunday. While the stuffed peppers cook for dinner, you can enjoy tacos for lunch! Bell Peppers - 6, tops cut off and seeded. Ground Beef - 1 lb, uncooked. Quinoa - 1 cup, uncooked. Black Beans - 1 (15 ounce) can, drained and rinsed. Corn - 1 cup, frozen. Feta Cheese - ½ cup. Cheese of choice - ½ cup or to taste. Red Onion - 2 tbsp, chopped. Tomatoes - ½ cup, chopped. Garlic - 1 clove, minced. Cilantro - 2 tbsp, chopped. Taco Seasoning - 2 tsp. Garlic Salt - ½ tsp or to taste. In a large bowl, combine all Filling ingredients. Lightly coat the inside of crockpot with nonstick spray. 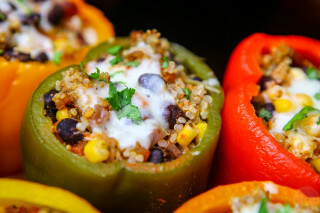 Arrange peppers into slow cooker and spoon fill them with the filling. Mix the sauce ingredients well and pour over and around the peppers. Cover and cook on low heat for 6 hours or on high for 3 hours. You can add more cheese before serving, cover slow cooker just so it melts. You will have a lot of the Filling mixture left. Add to a deep pan, add more taco seasoning if desired. Sautee for about 5 minutes until the beef is browned. Add 2 cups of water or broth and bring to a boil. Lower heat, cover and simmer until water is absorbed, about 20 minutes. Spoon fill mixture into taco shells and top with your favorite ingredients!